After several weeks of teaser shots from Lamborghini we finally got a full view of the Lamborghini Estoque concept this morning ahead of its official debut tomorrow morning. However, the photos were relatively small and details were scarce, but we are now able to bring you high resolution photos and full details via a press release from Lamborghini. The Estoque, named for the sword use by the Matador in a bull fight, is actually listed as mid-engined with the motor placed behind the front axle. The car sits extremely low at just 4.43 feet high, but still provides plenty of interior space for all four passengers due to the long wheelbase of over three meters. 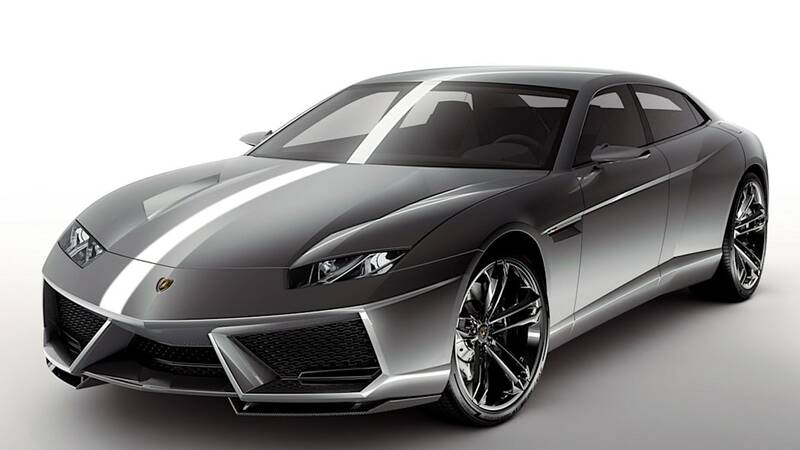 As we expected, Lamborghini states that no official decision has been made regarding production, but did hint that the Estoque could lead to a third model in the lineup with numerous engine possibilities including the V10 from the Gallardo LP560-4, a turbocharged V8, a V8 with a hybrid mode, or even a high-performance TDI. We'll be sure to bring you any additional information we can get tomorrow at the Paris Motor Show as well as many more photos. Until then, read up on the details of the Estoque in the press release after the jump and check out the new gallery of high resolution photos below. It is a Lamborghini like no other before it: a four-door sports car that sticks resolutely to its creed. The Lamborghini Estoque concept has everything that defines a Lamborghini: extreme, uncompromising and unmistakably Italian, it brings a whole new versatility to the brand's DNA - with its four seats and ample luggage space, this "everyday sports car" is a perfect fit for an equally versatile lifestyle. 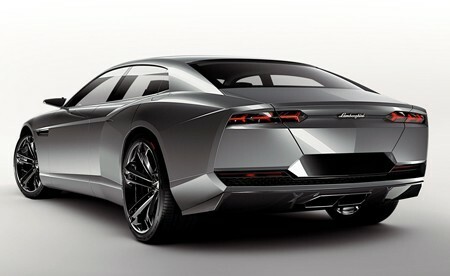 Lamborghini Estoque is a study, a concept created specifically for the 2008 Salon d'Automobiles in Paris. From the very first glance there can be no doubt that this is a Lamborghini - a car with compelling presence, both unique and unmistakable. The long wheelbase, the low profile, the broad track, the mighty, accentuated wheels, the clean surfaces and razor-sharp definition - every single line breathes the spirit of the Lamborghini brand. The Lamborghini Estoque is an entirely new interpretation of the Sant' Agata design ethic: it is a concept that provides a clear indication of the future. 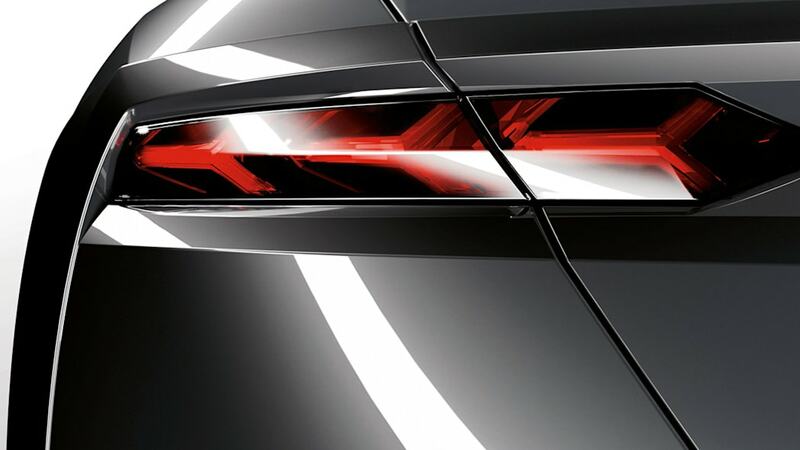 This applies to the new, elegant self-confidence of the lines themselves, but even more to the concept of the vehicle. 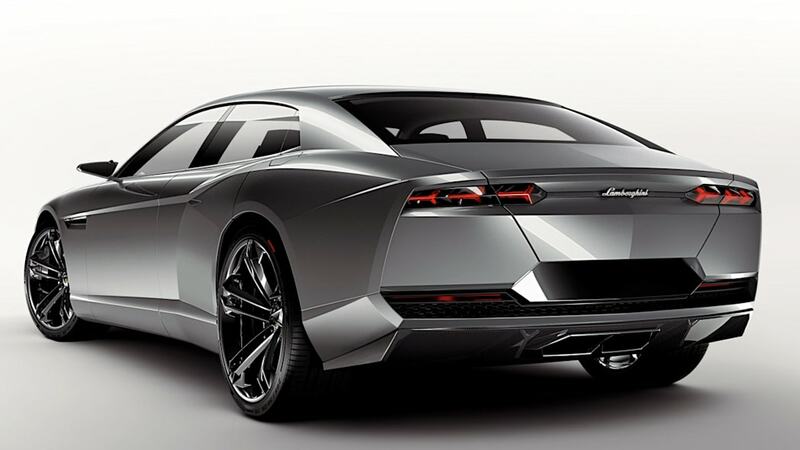 The Lamborghini Estoque is the first sedan in the history of Automobili Lamborghini, although "sedan" is more a reference to the number of doors than any other characteristics. Even sports sedan is an inadequate classification: the Lamborghini Estoque establishes a new category of super sports sedans. With a powerful front mid-engine, permanent all-wheel drive and a sophisticated, precision-tuned chassis, the Lamborghini Estoque boasts a unique technology package. In Paris, the Lamborghini Estoque demonstrates the innovation, the creativity and the design flair of the Lamborghini brand, currently represented by the enormous success enjoyed by Lamborghini Gallardo and Murciélago super sports cars. 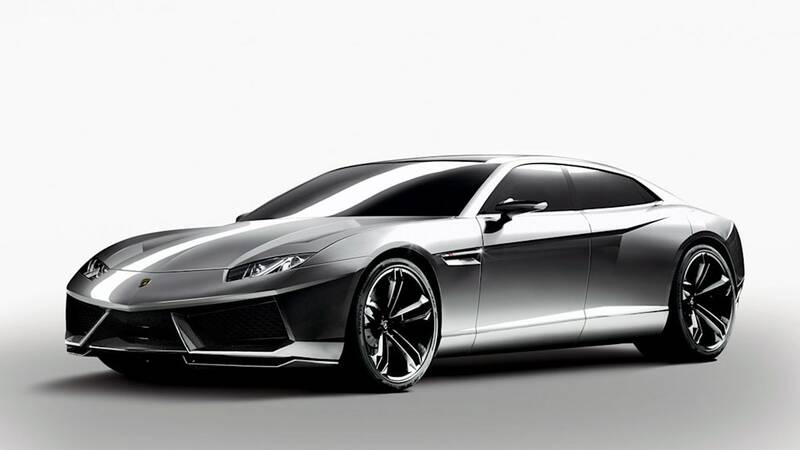 As a concept, the Lamborghini Estoque represents one of several possibilities for a third model series within the Lamborghini product line-up. 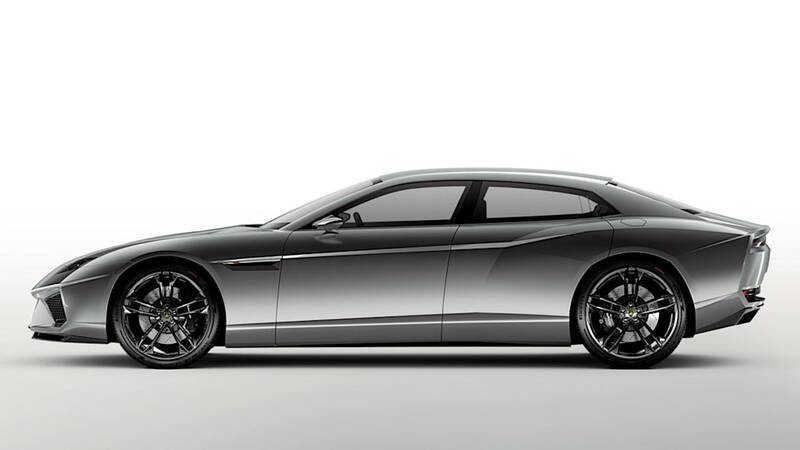 At this point in time, no decisions have been taken in respect of either a third model series of any kind or of the Lamborghini Estoque concept in particular. Of course, as a true Lamborghini, it goes without saying that the Lamborghini Estoque also bears a suitably powerful name with a rich heritage from the Spanish Corrida - bull fighting. The Lamborghini Estoque is a rapier (sword), approximately 90 centimetres (35.43 inches) long, used in a bull fight by the Matador. Lamborghini Estoque embodies the concept of a Lamborghini that is both a dedicated sports car and a relaxed Gran Turismo. As a sedan with four doors and four individual sports seats, it is a multi-faceted vehicle for multi-faceted lifestyles. The Lamborghini Estoque is the perfect travelling companion, be it en route to business meetings, the theatre, the golf course or even a weekend away with the kids. At the end of the day, it is the only car that allows you to share the singular driving pleasure of a Lamborghini with more than one person - possibly even with the whole family. And there is still enough room left over for weekend luggage or several golf bags. Despite its extremely low profile - at a mere 1.35 meters (4.43 feet) high - the Lamborghini Estoque is surprisingly spacious. The secret lies in its very long wheelbase which, in spite of the rearwards positioning of the front mid-engine, enables a relaxed, sporty seating position. Entering and exiting is also pleasingly straightforward through the large, wide-opening doors. At the same, the Lamborghini Estoque is a thoroughbred sports car with exceptionally refined power delivery, razor-sharp precision handling and a meaty engine tone. Challenging driving pleasure on a winding mountain road, followed by a relaxed, enjoyable journey along miles and miles of motorway- the Lamborghini Estoque is commanding across the entire driving spectrum, at the highest level. The Lamborghini Estoque's versatility makes it the perfect addition to the range of Lamborghini super sports cars. Such a Lamborghini must be immediately recognizable in its design as a unique and unmistakable work of art. For the Lamborghini Estoque, this is clearly a case of "mission accomplished." The proportions of the Lamborghini Estoque are simply fascinating: no other automobile combines so convincingly the elegance of length with the sporting attributes of a low profile and impressive breadth. Or to put it into figures - the concept painted in an all-new color, is 5.15 meters (16.89 feet) long and 1.99 meters (6.53 feet) wide, with a height of only 1.35 metres (4.43 feet). The wheelbase is a stately 3.01 meters (9.88 feet) - an equally important element of elegant vehicle architecture. And it is unequivocally Italian - the flat bonnet, the long wheelbase, the narrow window openings, the flat rear that ends decisively with a negative return - it is all pure "Italianità" on wheels; everything bears the design language of the large classic Italian four-door cars, albeit with a unique, modern interpretation. Pure Lamborghini. The front end of the Lamborghini Estoque is a clear and unambiguous statement of its sports car credentials. Its place amongst the family of Lamborghini super sports cars is also distinct and unmistakable - with its swooping V-shape, its two large air intakes pulled forward and the small front spoiler in between. 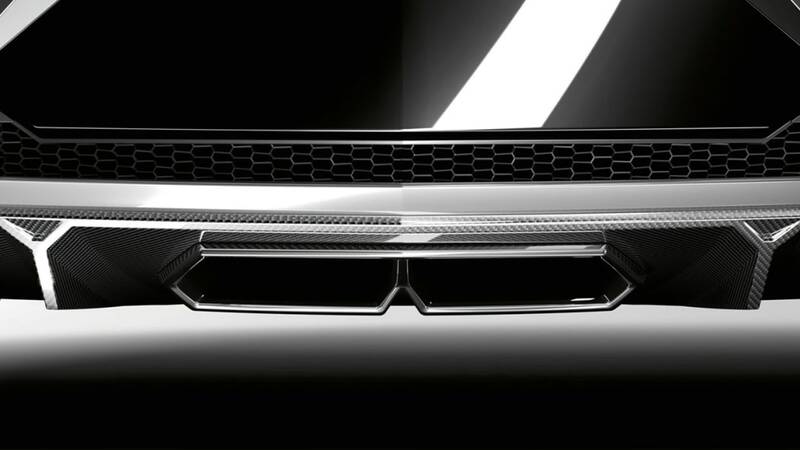 This front end design gives the Lamborghini Estoque a firm, low stance, while providing excellent aerodynamic efficiency. The large air intakes facilitate the cooling air that is important for such a high-performance vehicle and the spoiler was specifically designed to improve aerodynamic balance at high speeds. Such distinctive sports car architecture is only possible by positioning the front mid-engine well towards the rear. Despite the very low bonnet, it goes without saying that the Lamborghini Estoque fulfils all safety regulations and pedestrian protection standards. The bonnet of the Lamborghini Estoque makes the origins of the sheer power of this vehicle immediately apparent. The location of the engine is clearly evident through the distinct division created by two large air outlets and the additional emphasis of a central power area. Further air outlets are positioned both left and right in the wings, behind each of the front wheel arches. Together, with the division of the bonnet, these elements add emphasis to the area above the wheels, framing the front end of the Lamborghini Estoque like a taut muscle. 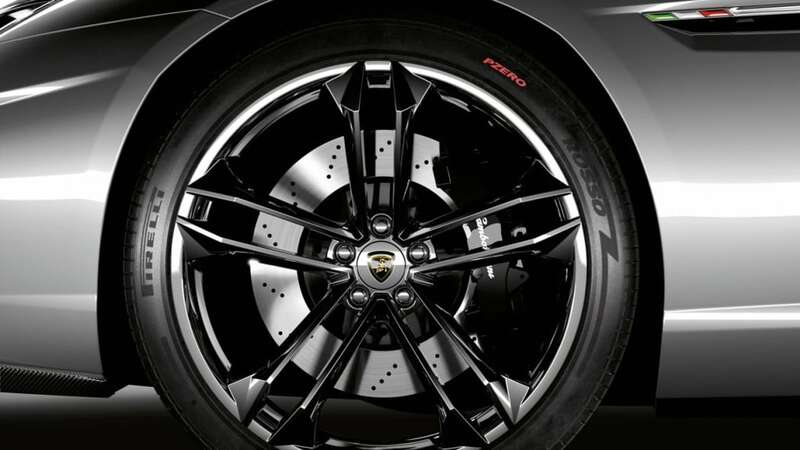 The permanent all-wheel drive that is typical for all Lamborghinis means that the 22 inch wheels, with their new five double-spoke design, also do their part in delivering power to the road. Here too, the Centro Stile has stuck firmly to the Lamborghini principle that form always follows function; after all, the ample cooling air flowing into the high-performance driveline also has to move quickly out of the vehicle. Its proportions guarantee the Lamborghini Estoque an impressive appearance. The skilled sectioning along the flanks of the vehicle gives the body shell an incredibly muscular form. Beneath the flat surfaces of the bonnet, the incredibly powerful shoulder line, a further side line rising slightly towards the rear and, finally, the equally distinct sill line all add emphasis to the flow of power from the engine to the magnificent 23 inch rear wheels. The masculine profile is completed by the negative return of the rear end. This adds further tension to the form of the Lamborghini Estoque - the whole car looks coiled and ready to pounce at the drop of a hat. These sharp lines frame a fascinating interplay of surfaces across convex and concave curvatures. The Lamborghini Estoque clearly displays the design language of the Centro Stile Lamborghini with a distinctive elegance. The flow of form is brought to its conclusion by the broad, even expanse of the rear end. The horizontal split created by the flat LED light clusters and the large, mesh-covered lower air outlets bring additional emphasis to this breadth. A narrow, slightly slanted "frame" panel surrounds the whole rear aspect and further highlights its powerful elegance. Precise details, such as the hexagonal fuel caps on both sides of the vehicle, characterize the depth of the design language. 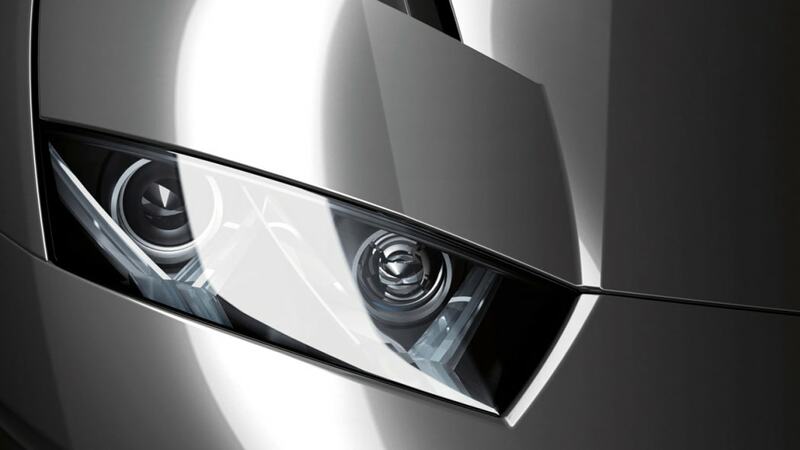 The front headlamps, featuring bi-Xenon and LED technology, carry forward a theme evident in both the Lamborghini Reventón and the Lamborghini Gallardo LP560-4 - the Y-shape of the daytime running lights. 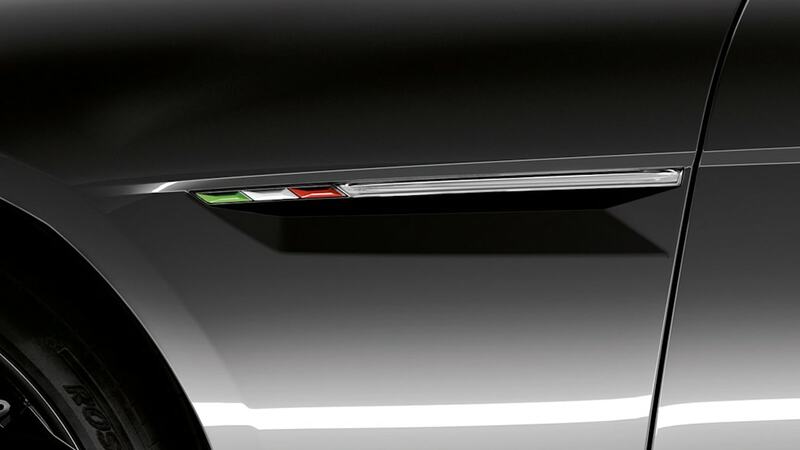 The tiny green/white/red flag adorning the front wings discreetly highlights that an automotive statement as uncompromising as this one can come from only one country on Earth - from Italy. Despite its extremely low profile, the Lamborghini Estoque offers a surprisingly generous feeling of spaciousness. The length of the interior facilitates a relaxed seating position for all four individual seats and plays a significant role in the supreme comfort of this super sports sedan over long distances. The interior reflects elements of the exterior design language, also evident in the cabin of the Lamborghini Estoque - in the distinctive lines of the door panels or in the swooping V-shape applied to the cockpit, reflecting the form used on the front end and on the bonnet. The dominant material of the interior is highest-quality Nappa leather. The four individual seats boast sporting contours, supreme long-distance comfort and extensive electrical positioning options. The cockpit presents the driver with a large-area LCD screen displaying vehicle and route information. A range of presentation formats are available for selection depending on personal preference - a distinctive classical layout with circular instrument dials, or an innovative digital display. A top-class audio installation and a sophisticated rear seat entertainment system round off the equipment. Like the interior, the luggage compartment of the Lamborghini Estoque is also surprisingly spacious. Despite the low-profile rear end, it has plenty room for several golf bags or pieces of luggage. As a pure concept car, the Lamborghini Estoque is a design exercise and a further indication of the innovative power of the Lamborghini brand. Yet, it is based on a feasible technical concept that offers a whole range of fascinating alternatives for the body shell and driveline. Just like the brand's super sports cars, the Lamborghini Estoque uses a mid-engine layout. However, the high-performance driveline used here is not located in front of the rear axle, as in the Gallardo and Murciélago or in the Reventón, but behind the front axle. This front mid-engine concept, with the driveline set way back, facilitates balanced weight distribution and a centre of gravity close to the vehicle's vertical axis. Both ensure the unparalleled agility and handling precision of a mid-engine vehicle. Like all contemporary Lamborghini models, the Lamborghini Estoque is also equipped with permanent all-wheel drive. It distributes the engine power to all four wheels, thus making for superior traction in all driving situations, as well as providing extra reserves for extremely sporty driving and for challenging weather conditions. A range of drivelines is conceivable for the Lamborghini Estoque. This is headed up by the highly-acclaimed Lamborghini ten-cylinder from the Gallardo LP 560-4 - with more torque and higher revving than virtually any other engine. 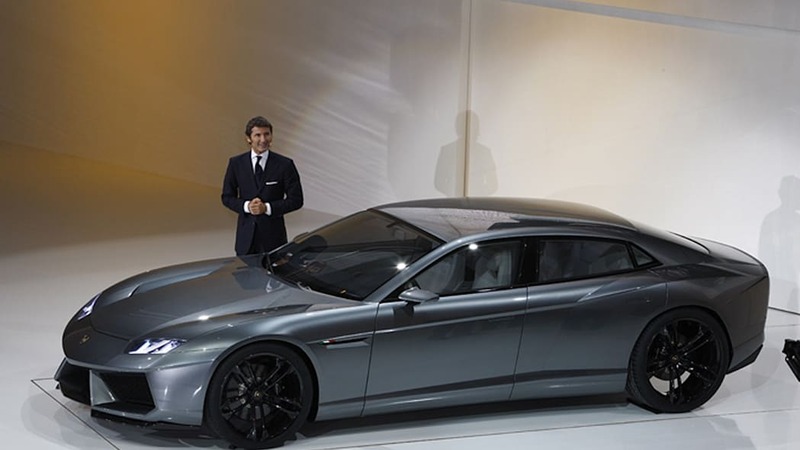 A complementary alternative could be a turbocharged eight-cylinder derived from this V10. A particularly economical, but nevertheless dynamic, variation would be a V8 with a hybrid module or an extremely high-performance TDI. With the Estoque, the Centro Stile Lamborghini has created further proof of its creativity and attention to detail. The design centre that opened in 2004 is a studio of creatives, designers and model makers that combines the culture and the spirit of the brand with the power of innovation and of creating a new aesthetic. The Centro Stile Lamborghini is part of the best tradition of Italian vehicle design, and is leading the way forward with the latest in working techniques. The Centro Stile is located in a 2,900 sq. meter (31,215 sq. feet) facility, where it occupies two interconnected floors. The generously proportioned design studio is equipped with two full-size surface tables and their associated tooling and measuring equipment, while further areas house the latest in computer workstations for the creative experts and a workshop for the model makers. The Centro Stile is also connected directly to the neighbouring Ufficio Tecnico - the direct link to Lamborghini's development department ensures the rapid realization of ideas. Speed is a key aspect for Lamborghini, for both its cars and its working processes; the Reventón was created in the record time of less than one year. From the first sketches made either on paper or using the three-dimensional computer program, through 1:10 or 1:4 scale models to full-size models, the complete design process is organized within small, fast-moving teams. Since it was founded, the Lamborghini brand has been bringing innovative design trends to the rarefied atmosphere of the world's most desirable automobiles, and producing vehicles with absolutely unmistakable character. Models such as the Miura and the Countach were way ahead of their time, but quickly attained the status of timeless classics. From their first appearance, every new Lamborghini is destined to become a legend and sought-after collectors' item. With the current Murciélago and Gallardo, Lamborghini has once again perfected an innovative design language. The exterior proportions provide an indication of the power and dynamic character of the driveline. Crisply-defined edges, precision lines and clean surfaces result in a design that is reduced to its very essence. Every element is designed precisely in accordance with its function. Examples of this on the Lamborghini Murciélago LP640 include the movable cooling air intakes and the asymmetric sills; on the left side of the vehicle, the air intake is significantly larger to accommodate the flow of fresh air to the oil cooler. The unmistakable form of a Lamborghini is something that always speaks for itself: ornamentation or decoration of any kind has absolutely no place here. This firmly places the current models that bear the sign of the bull within the best traditions of their brand and of 60s and 70s Italian vehicle design. The sports cars of that time were acclaimed for their perfect proportions and for their objective, functional elegance that required no embellishment of any kind. The purist execution of the lines is complemented perfectly by the passion for detail possessed by the designers in Sant' Agata Bolognese. The rear view of the Murciélago LP 640 is distinctive not only for its impressive power, but also for the fine interplay of the elements in the sophisticated rear light cluster. A Lamborghini is a high performance athlete. Its high degree of sensuality is based on precision, performance and spontaneous action. This type of elegance is the elegance of pure, unadulterated power. This Lamborghini DNA is carried forward into future products at the Centro Stile, which is destined to continue to set clear design trends - the Lamborghini Estoque is the perfect example. The design centre on the site of the historical birthplace of all Lamborghinis guarantees the super sports cars with the bull brand will remain exclusive, sensual and challenging - and always unmistakably Italian.